A fire destroyed newly-constructed buildings at Silver Sands State Park late Tuesday night. 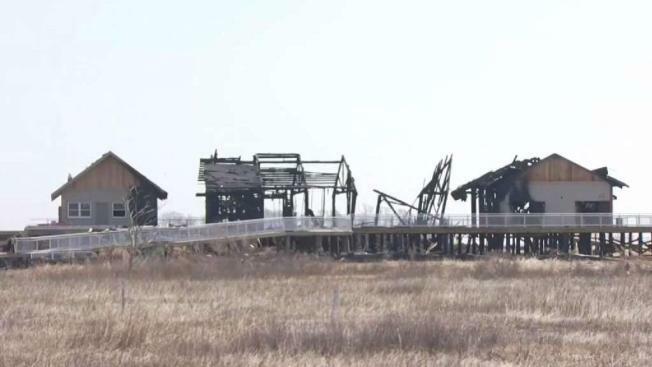 A fire has destroyed three buildings that were part of a multi-million dollar construction project at Silver Sands State Park in Milford and the park is closed as officials investigate the cause of the fire. Firefighters were called to the park around 10:30 p.m. Tuesday after getting a report of a large fire. When crews arrived, they found two of the buildings fully involved and a third building was nearly 50 percent involved. Firefighters battled the fire and brought it under control in approximately two hours, fire officials said. The buildings that were destroyed were part of a multi-million dollar construction project. The buildings housed a concession stand and dining area, public restrooms and an office to serve visitors of the park, according to fire officials. Construction began on the buildings in 2018. The nearly completed buildings were scheduled to be open for Memorial Day weekend. The fire was so intense it was picked up on weather radar. The park is closed on Wednesday while investigators work to determine the cause of the fire. EnCon Police, the State Fire Marshal and other agencies are investigating. It is unclear when the park will reopen. Officials from the Department of Administrative Services, which oversees the construction, is already coordinating meetings with the contractor and the Connecticut Department of Energy and Environmental Protection to determine the next steps for the project, DEEP said in a release.